Here’s my March newsletter, a little late as I took two weeks off with all the travelling I have been doing. 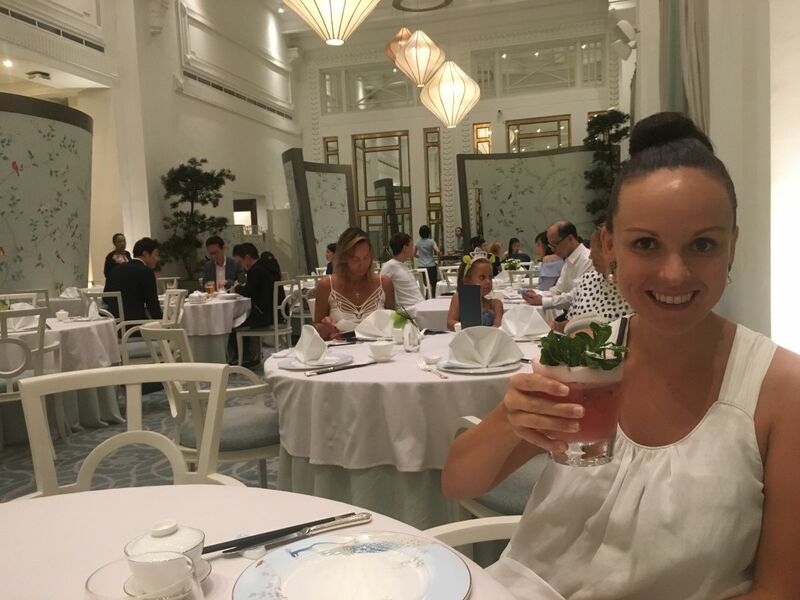 First a couple of days in Singapore with my daughter and family which gave me the chance to take Lucy out for a belated birthday dinner – see below about our dinner in Jade Restaurant in the Fullerton Hotel. Then it was a quick late overnight stop in London before flying on to Oslo for the Parabere Forum, an annual event that gathers thought-leaders in the fields of gastronomy, food and nutrition, especially celebrating the role of women in the sector. It was incredible with the likes of Alice Waters from Chez Panisse in Berkeley California speaking. 400 influential women from around the world, and a few men. there was a good contingent of Australians including Kylie Kwong who gave a personal presentation, and Joanna Savill who MCed the formal presentations. It was so moving to be there, share camaraderie with others and see beautiful Oslo. I stayed on for a couple of days too – but all of this will be in a subsequent newsletter, so watch out. 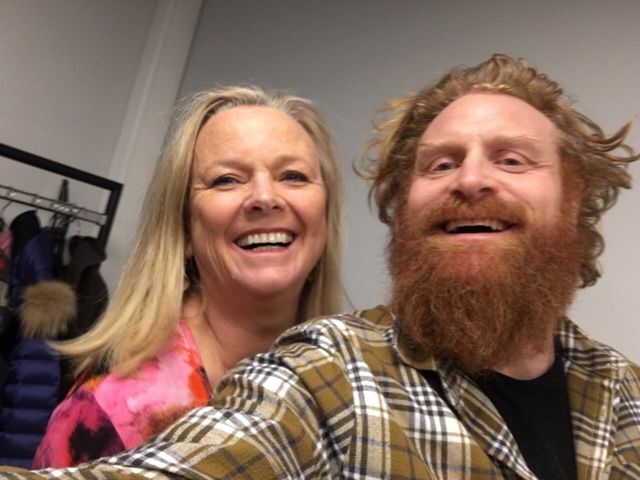 I did, however, meet with Kristofer Hivju who is also a co-woner in a Norwegian Production company, Tinde Films, some of whose productions, our TV company Flame distributes. Now I’m back in London where the blue skies have gone, trying to catch up. Come to Puglia with me? Enticing new season Royal gala, Fuji, Golden Delicious and Delicious apples are super crisp and tasty. Sweet persimmons season has started. Sweet persimmon also known as Fuji fruit look like are persimmon however unlike traditional persimmons, they can be eaten hard and crisp. Their attractive tangerine coloured flesh is a tasty addition to a salad or cheese board. 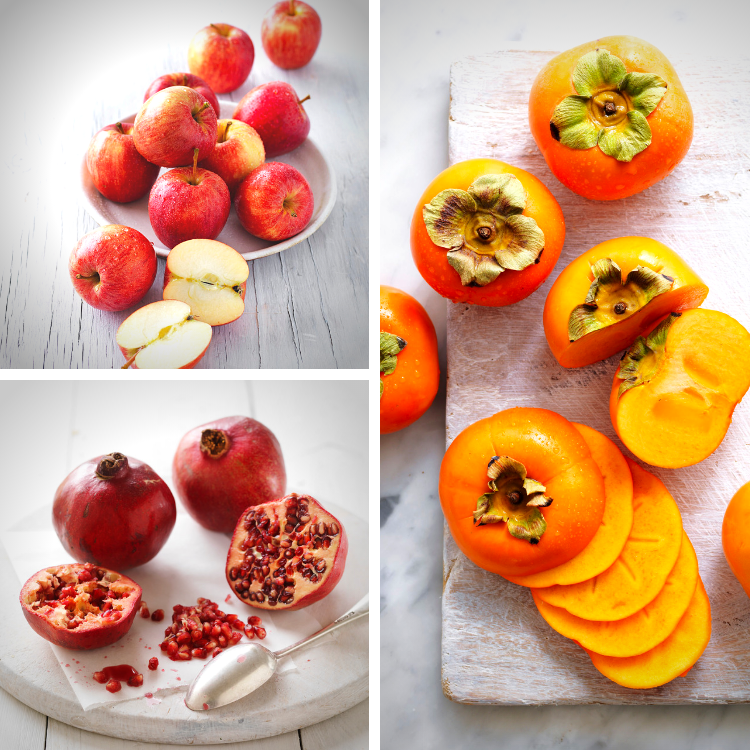 Pomegranates are increasingly being recognised as a rich source of antioxidants and adored for their dynamic ruby coloured nectar and arils. 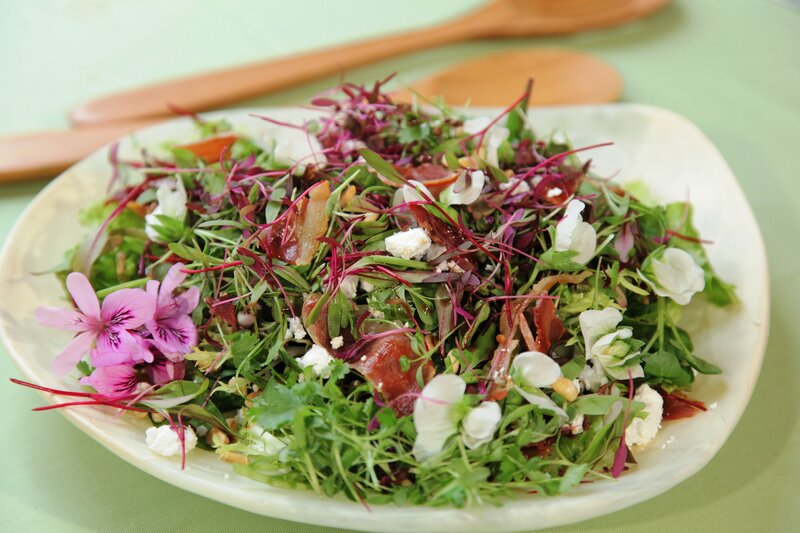 This fig, red cabbage & pomegranate salad is a favourite. Flavoursome Williams’ pears are a top buy. Roasted pears are a superb accompaniment to roast pork and combine deliciously with parsnips. Remember that pears continue to ripen are harvesting so select firm, mature pears and ripen at room temperature. If poaching or roasting pears, use firm pears for the best result. Everyone loves stonefruit and plums are no exception. Late season plums include Autumn Giant, Teagan Blue and October Sun. These Easy Plum Tarts are an easy mid-week dessert. Be sure to pick up figs, this week as the quality is excellent. Naturally sweet figs are delightful slice and served with muesli, add them to a salad or enjoy them grilled or baked. Figs team superbly with prosciutto, cream, blue cheeses, raspberries, cream, honey, rocket and nuts. Or for something different halve them, sprinkle with chilli, olive oil and a shaving of parmesan. Super sweet sultana grapes are delicious eating right now. The red-skinned crimson seedlessare a choice buy for quality, crunch and value. Try roasting a tray of grapes to serve with cheese or toss through a salad for sweetness. If you have ever travelled through South East Asia, you have probably seen or enjoyed the exotically different mangosteen. Its subtle, delicate, sweet-acid taste is refreshingly different and unlike other fruits. Australian grown mangosteens are in season for another 4-5 weeks, so don’t miss out on these delicious fruits. Funnily enough I saw some in the Borough Market in London this morning. 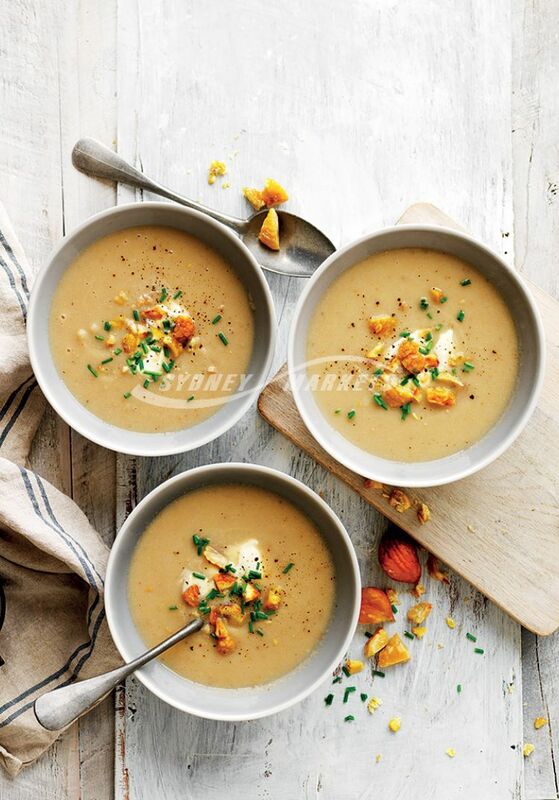 Sweet by name and sweet by nature – sweetcorn is a choice buy and so versatile: steam, boil, roast or BBQ. Okra also known as Lady’s Fingers are a green furry pod that is used in soups, casseroles, curries and are delicious battered and deep fried. Trim 500g okra and cook in boiling water for 5 minutes. Golden fleshed kumara tubers are excellent value. Add diced and roasted kumara to a salad, they make delicious wedges, or serve roasted kumara with eggs & avocado salsa. Shepard avocados are a pear-shaped variety with a smooth green skin and a golden buttery flesh which does not turn brown when cut. With an average size 200g-320g they are in season from February to May and good value. Firm, papery skinned brown onions are full of flavour. Perfect for a bowl of nourishing French onion soup or add them to a roast or casserole. Cauliflower cheese has long been a childhood favourite but you want believe how fabulous this snow-white brassica is when crumbed served as cauliflower ‘popcorn’ with avocado & bean smash tacos. 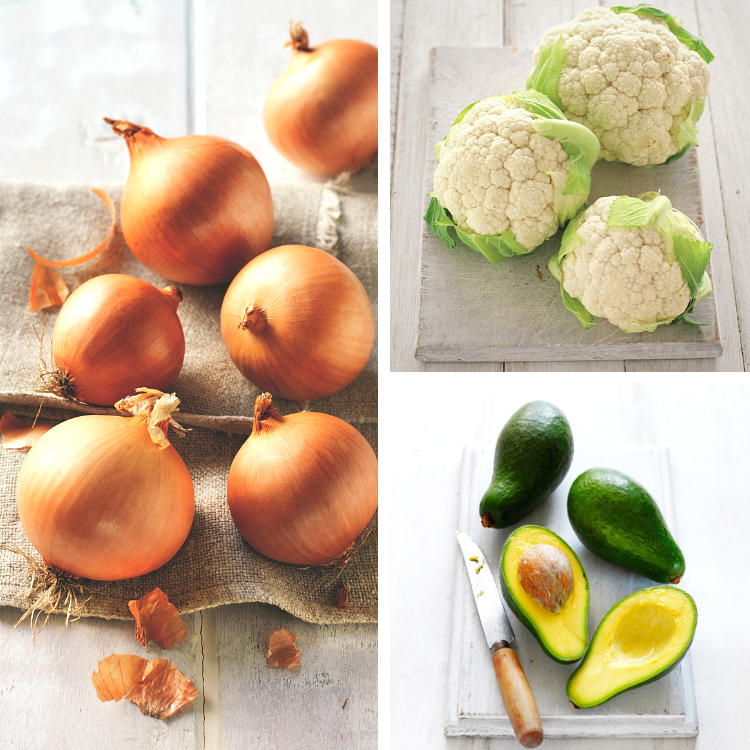 Pop a cauli in the trolley this week. and try roasting sprinkled with cumin and extra virgin olive oil. Carrots are great tasting and and good value. Microwave sliced carrots in a drizzle of honey, pinch of ginger and a little butter until tender. When visiting your local green grocer this week keep an eye out for fresh pistachio nuts. Available for only 4-5 weeks they are a seasonal treat. Their attractive soft, pink and yellow mottled skin covers the hard, semi spit shell. The nut itself is mild tasting with a creamy texture and is delicious as a healthy snack and a tasty addition to baked goods. Asian leafy greens like bok choy, choy sum, gai lum and on choy/ kan kong (water spinach) are terrific value. Make a stir-fry healthier and boost the texture and colour. Versatile zucchini is a choice buy. Barbecue, char-grill or grate and add to cooked pasta. Zucchini is also an appetising addition to a cake batter, adding extra nutritional value and moisture and a delicate flavour. For a nutritious and flavour packed meal try this mint & chilli chimichurri with chicken skewers served with zucchini noodles. Have you ever tried pickling your own olives? Whilst a bit time consuming it is a very rewarding and a delicious experience to pickle your own olives. Green olives are plentiful right now so gather up your jars and get bottling. IN SEASON from mid-March through to July, fresh chestnuts have a unique nutty flavour. Their flesh becomes soft and tender when cooked. SELECT chestnuts that feel heavy for their size with firm glossy brown shells. Some varieties are easier to peel than others. STORE uncooked chestnuts in a paper bag in the fridge crisper for 2 to 3 days or in an airtight container for up to 10 days. 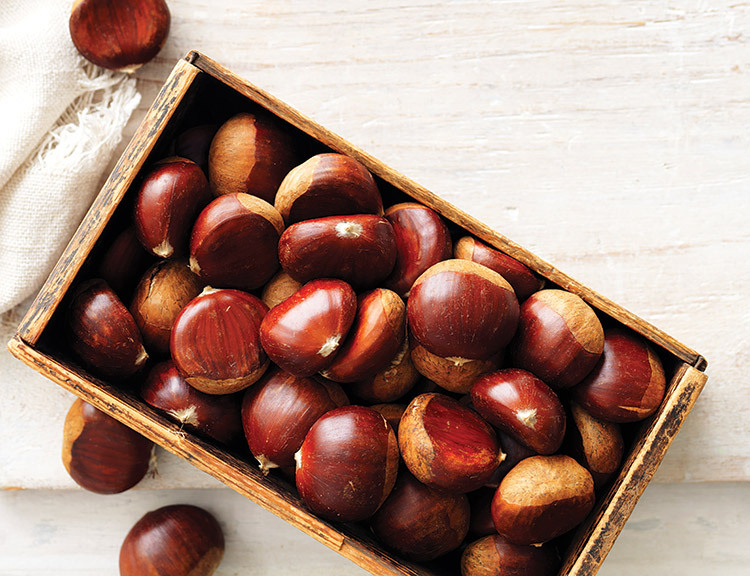 Once cooked and peeled, chestnuts can be stored in an airtight container in the fridge for up to 4 days. Alternatively, freeze cooked chestnuts in freezer bags for up to 6 months. TO PREPARE AND ROAST chestnuts, cut a shallow cross into the flat side of the shell. Roast at 200°C on a baking tray for 15 to 20 minutes until the shells split open. Wrap chestnuts in a clean tea towel, stand for 5 minutes then peel while still warm. Alternatively, place halved chestnuts in a saucepan of cold water, bring to the boil and simmer for 15 to 20 minutes. Remove one chestnut at a time and scoop out the flesh while still warm. Cut fresh chestnuts in half across the width of the nut, then place in a pan of cold water and bring to the boil. Simmer for 15-20 minutes or until the flesh is tender and easily separates from the shell. To peel, simply remove one chestnut at a time from the water while still warm. Chestnuts will slip easily from their shell. for 2-3 minutes or until the flesh is tender. Timing may vary depending on chestnut size. For convenience, purchase a kilo or two of fresh chestnuts at a time. Cook and peel the chestnuts, then store prepared chestnuts in bags in the freezer so they’re on hand and ready to add a special nutty flavour to your weekly meals. Cut a shallow cross into the flat side of each chestnut. Place chestnuts on a tray under a moderate to hot grill or place directly on a barbecue grill. Cook for approximately 15-20 minutes or until the shells blacken and split open, turning every few minutes. Once cooked, remove chestnuts from the heat and wrap in a clean tea towel for 5 minutes. While still warm, peel off the outer brown shell and papery casing. Ready-to-use cooked and peeled Australian chestnuts and chestnut products are available. Please visit www.chestnutsaustralia.com.au for more information. Recipe from the award-winning TV series and book, Lyndey Milan’s Taste of Australia. This brings some of the best of the Armidale region together, using award winning Milly Hill lamb back strap wrapped in vine leaves fresh from the vine at Peterson’s Winery and also poached in their wine. Blanch vine leaves in hot water for a few minutes. Drain and refresh under cold water. Place on paper towel to remove excess moisture. In a mortar and pestle or a small food processor, make a paste with anchovies, garlic, cumin, fennel, chilli and salt and pepper. Add one tablespoon olive oil and combine to form a paste. Cut each back strap in half horizontally. Using a sharp knife, make a pocket along the long side of each half ending 2 cm from each end. Season inside the pockets and on the outside generously with salt and pepper. Spoon paste into the pocket and wrap a vine leaf around the middle to cover the pocket. Secure vine leaf around lamb with kitchen string. Place wine and stock in a large saucepan or deep frying pan, large enough to hold the lamb in a single layer. Top up with extra water if necessary and bring to the boil. Lower heat to a simmer and lower in lamb parcels. Poach lamb gently for 6 minutes, turning over once halfway through cooking. Remove from heat and allow to rest in poaching liquid for 5-10 minutes. Meanwhile, heat olive oil in a large frying pan over medium high heat. Add olives and capers and fry for two minutes. Slice cauliflower into large slices approx 0.5cm thick. Add to the pan with oregano and season with salt and pepper. Cook, tossing occasionally, for 10 minutes or until golden and slightly softened. When almost cooked, add verjuice (if available) and reduce. To serve, remove string from lamb and cut on the diagonal. 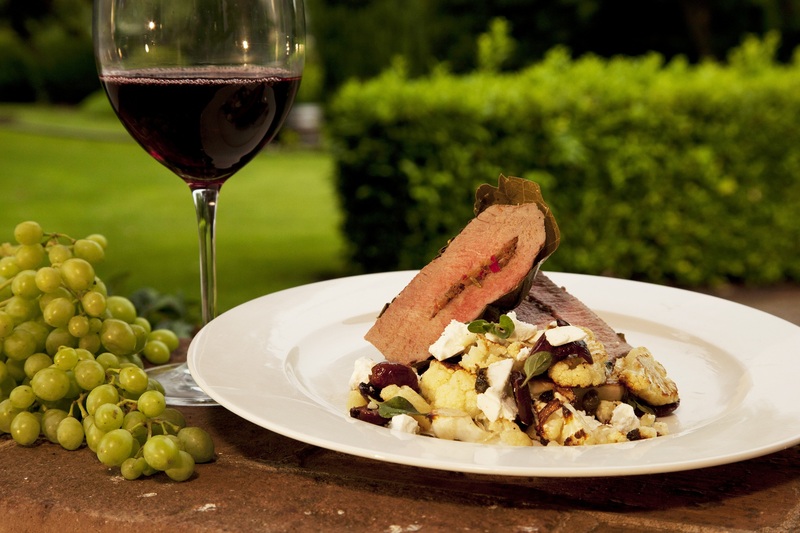 Divide cauliflower salad among plates, crumble over fetta and serve beside carved lamb. Well, I’m back in London now and loving the local farmers’ market with its seasonal vegetables. 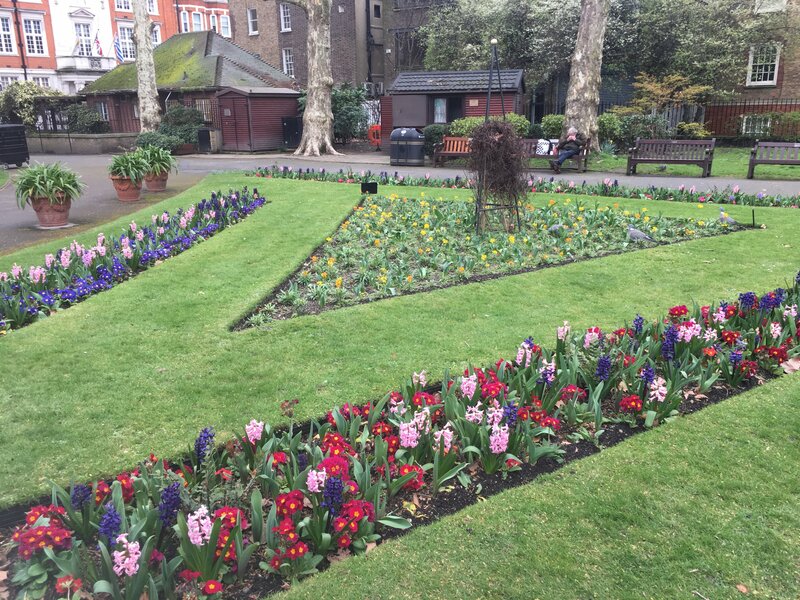 It still feels like winter but the produce and the flowers in the parks are moving into spring. Suddenly every shade of green appears from pale green fennel, to bright wild garlic to intensely dark artichokes. I’m loving the leeks, Tuscan cabbage, cauliflower, purple sprouting broccoli, padron peppers, myriad types of potatoes with Pink Fir Apple a favourite and parsnips all at great prices. Proof that Spring is on the way, at Borough Market I saw green and white asparagus from France, though it’s a bit early for the English season. I enjoy my local Farmers Market every Sunday and have my favorites I buy from. 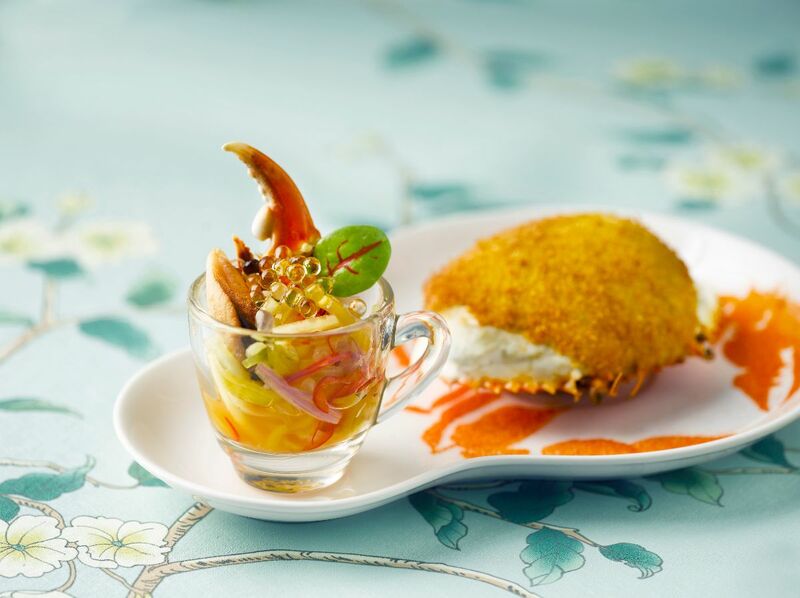 It’s hard to resist dressed Dorset crab which has become something of a Sunday treat. I let what I see and buy dictate what I will cook during the week, though I know it takes confidence as a cook to be able to do this and not shop with recipes and a list in mind. I was therefore interested to read this from Bon Appetit magazine’s Food Director on how she eats and shops. I am amazed at the efficiency of online ordering and delivery here, considering the size of the city. I had forgotten the wireless mouse for my laptop and, ordering on Saturday it was delivered on Sunday and an external port was delivered the same day, in the evening!It was lovely to attend the official International Women’s Day celebration in Australia House with the Australian Women’s Club London focussing on the topic “Balance is Better”. 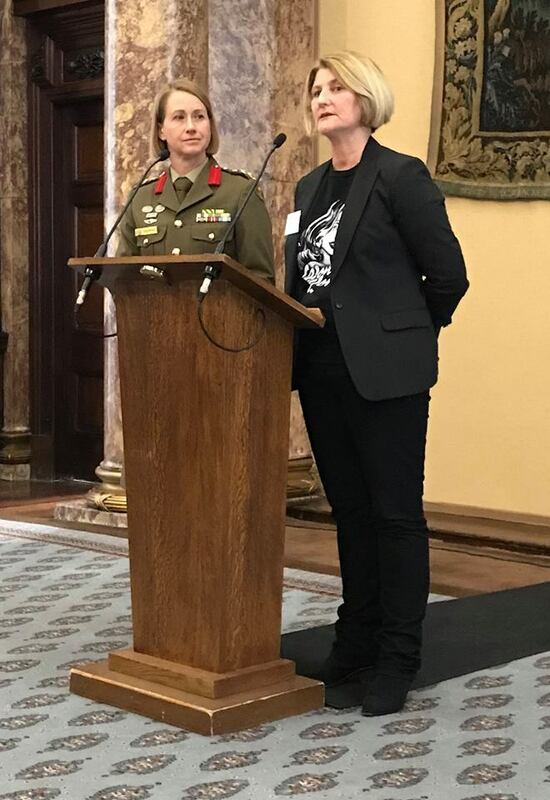 The speakers were Colonel Sue Graham, Army Advisor, UK, AHC and Karyn Sassella, Red Cross Dunant Awardee who discussed their global experiences within the peace-keeping and humanitarian fields. There was time for questions after and we also heard from Laura Mannes from the London Air Ambulance charity which had us all riveted. Their role is to take medical and surgical assistance to the site of an accident or emergency before getting victims to hospital. I can never resist a trip to Borough Market, especially at this time of year when it is not so full of tourists. 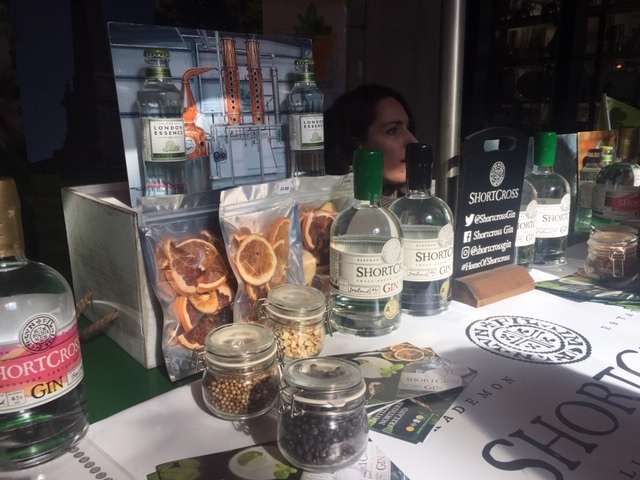 Northern Ireland had a special area there in the lead up to St Patrick’s Day and I enjoyed tasting two different gins from Shortcross and also sampling a massive oyster. 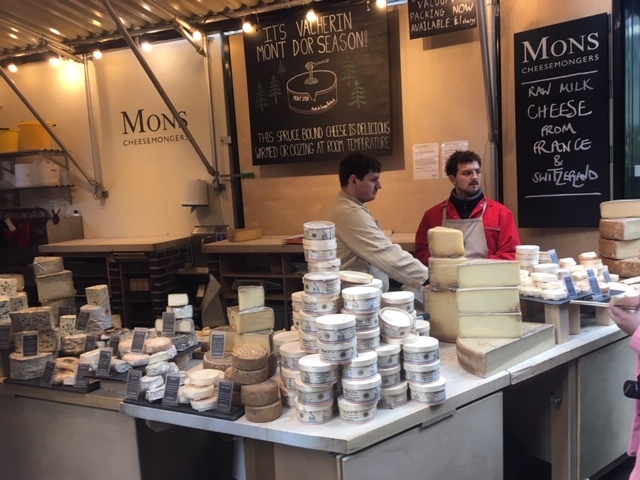 It’s also a joy to try the different cheeses there and Mons is one of the best stands. I bought some wonderful nutty, smooth gruyere. Jade restaurant in the historic Fullerton Hotel Singapore, now 11 years old, is an oasis of calm in an interior refurbished in 2017 along with a revitalised menu from Executive Chinese Chef Leong Chee Yeng. The 120-seat establishment, with two private rooms and two partitioned areas,has a jade colour palette with specially commissioned wallpaper and overhead lantern lighting giving a soothing and elegant ambience. We began with crab meat which had been steamed, removed from the shell then fried with onion in a rich creamy sauce, put back in the shell crumbed and deep-fried. Not something I might normally choose but it is a Jade Original and was absolutely delicious, the crab amazingly not overcooked nor its flavour masked and complemented by a crab claw in a tangy mango salsa. 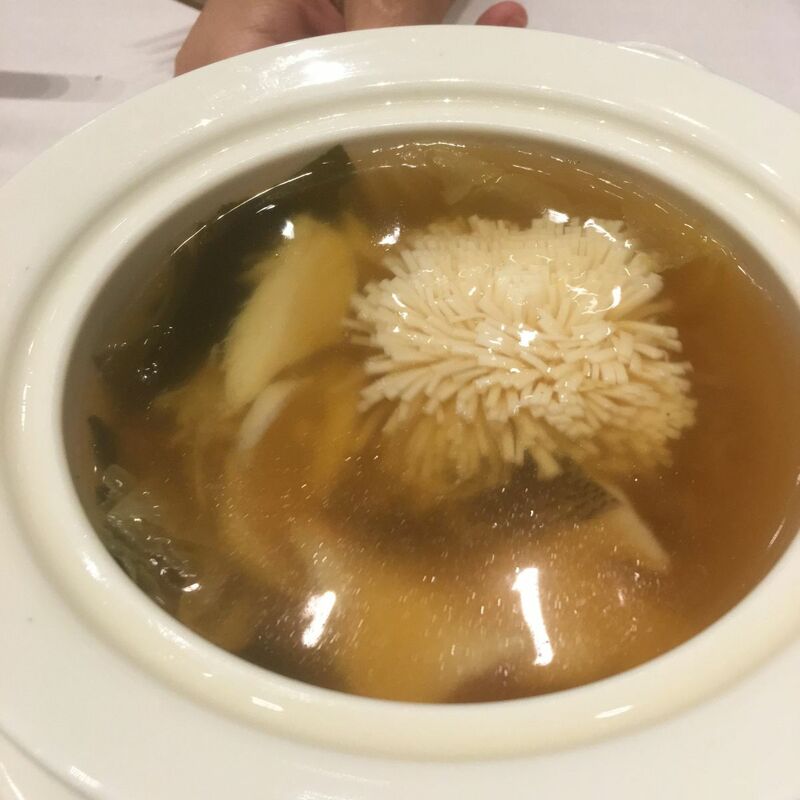 I’d love to see the knife skills of the chef in action, as a flavoursome seafood broth contained not only more crabmeat, but a block of tofu cleverly cut to look like coral, shimmying in the liquid. Perhaps the star turn was the Kagoshima Wagyu beef, another Jade original. 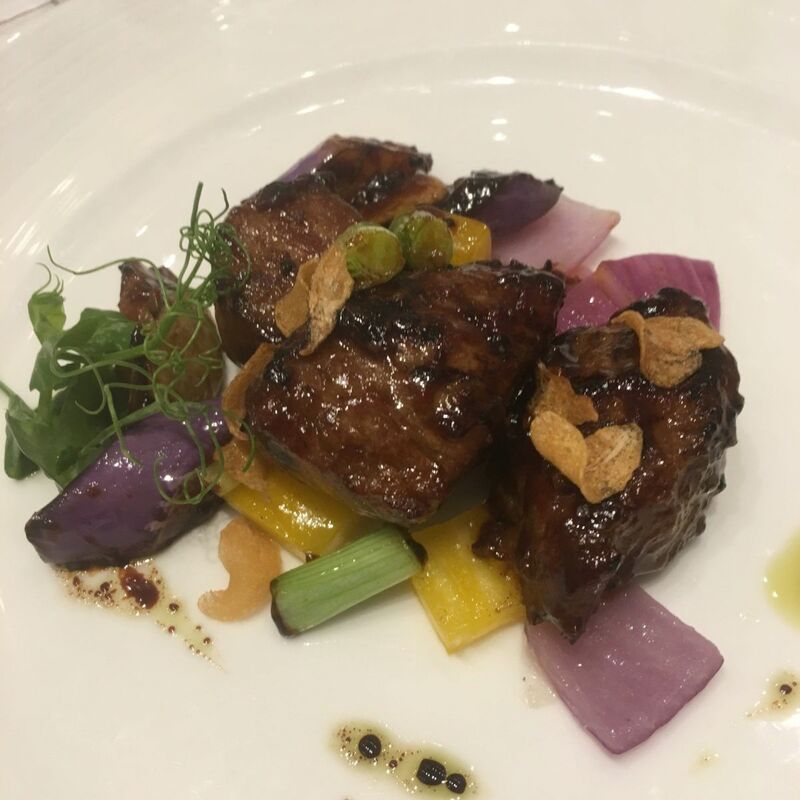 I can see why it stays on the menu: melt-in-the-mouth beef, showing the classic Chinese love of textural contrast, with crisp red onions in a black pepper sauce and finished with crisp garlic. 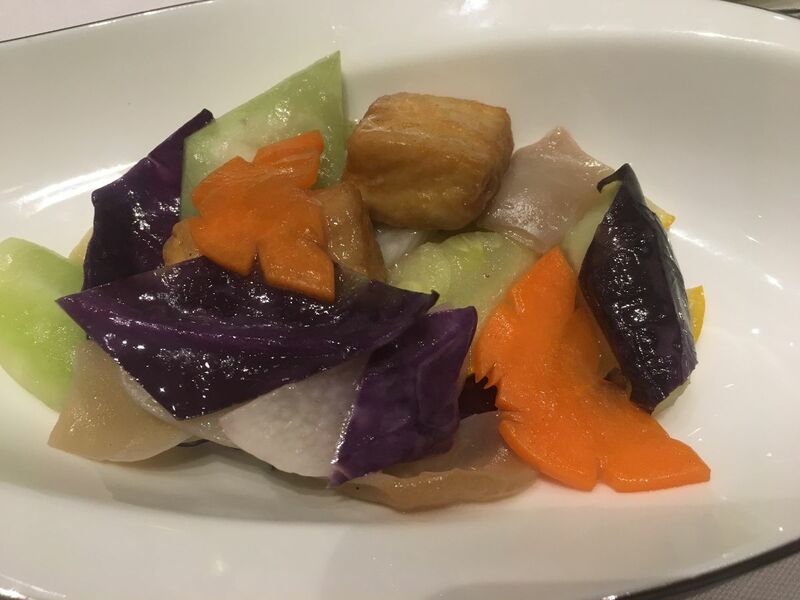 The vegetable course was also packed with flavour, five different coloured vegetables accompanied by house made beancurd and delicious to eat on its own. 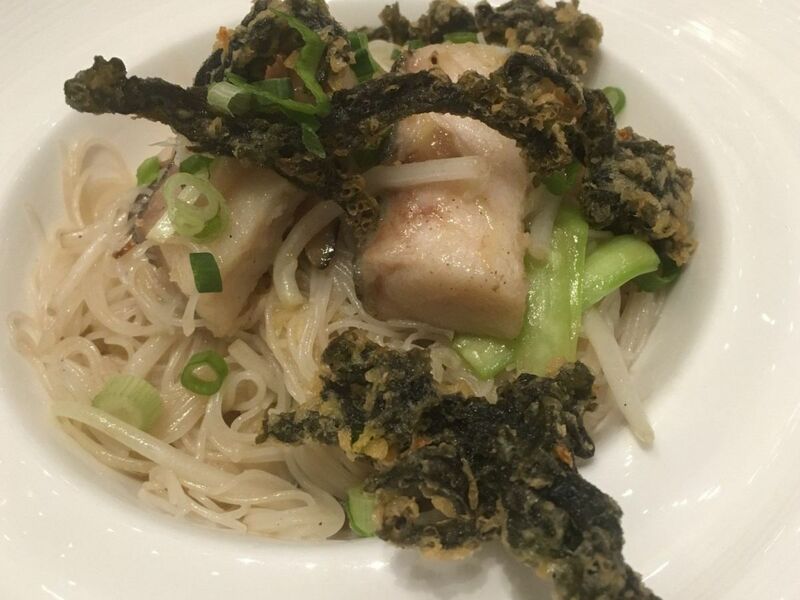 Garoupa reappeared, this time adorning rice vermicelli which had been simmered in fish broth and finished with deef-fried seaweed for textural contrast. Dessert was a refreshing Pina colada ice shaving with champagne jelly. Service is fabulous – old school Chinese with courtesy and attention to detail, the Matire’d welcoming us, explaining the menu, helping with wine choices and ensuring we were comfortable. Then the most delightful young lady brought and explained each of our dishes. And in a city where wine is not inexpensive The Fullerton Bay wines offer excellent value for money.I’ll be back to explore more. 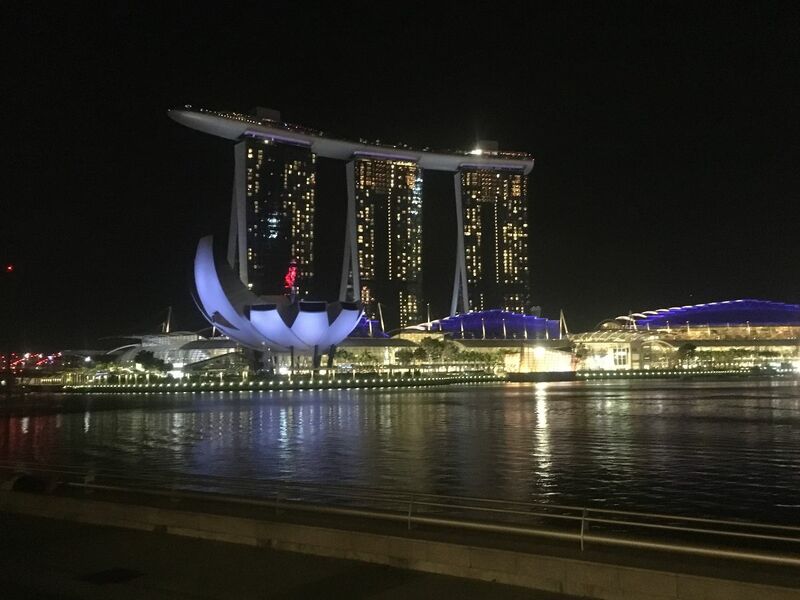 The Fullerton Hotel and Fullerton Bay Hotel are across the road from one another, part of The Fullerton Heritage precinct which is home to some other venues, situated in spectacular buildings in the heart of Singapore, with the best views of the Marina Bay and the Singapore skyline. 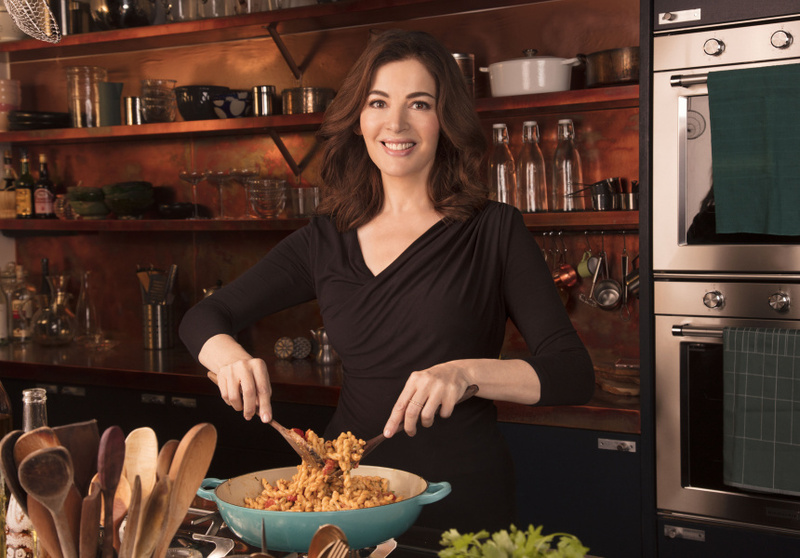 Read in Broadsheet where Nigella ate in Sydney – she’s chosen the best. 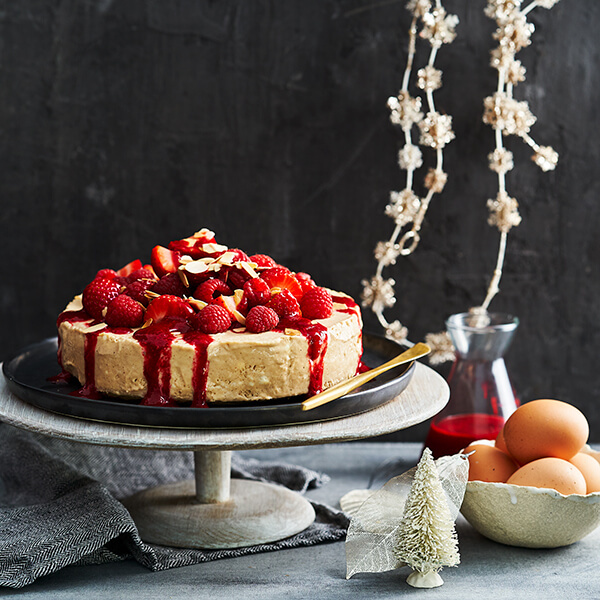 Kerry Heaney writes about Top Australian food trends for 2019. Here’s a guide to where to escape the tourist crowds and have coffee with locals who know where to find the best coffee in town Melbourne’s best secret coffee spots. I love this piece in The Guardian about three neglected herbs to enrich your kitchen garden. I received a press release during the week from MAD and now it is written up in the New York Times how Denmark will school chefs in global problems and solutions. I must agree Why cooking is such a good mindful activity. I am working with Jorg Gartelmann and Regattta Executive Chef Logan Campbell to create a unique experience for the friends of Gartelmann Wines and anyone else who is interested in this Lovedale winery. Do come if you can. More details www.gartelmann.com.auThe BOX on the Water presents a series of monthly dining experiences, created by a number of Australia’s most acclaimed celebrity chefs. People so often ask me what is my favourite dish or cuisine. As an Australian, I say my cooking style is global, though with a definite Australian freshness of style. I am often asked what my signature dish is, and I must say, I do often serve paella. It is such a gret dish for a dinner party as most of the prep is done prior to guests arriving and it looks great when put on the table in front of people. My favourite recipe I have developed after years of experimenting is in my book Balance. Matching Food & Wine What Works and Why. 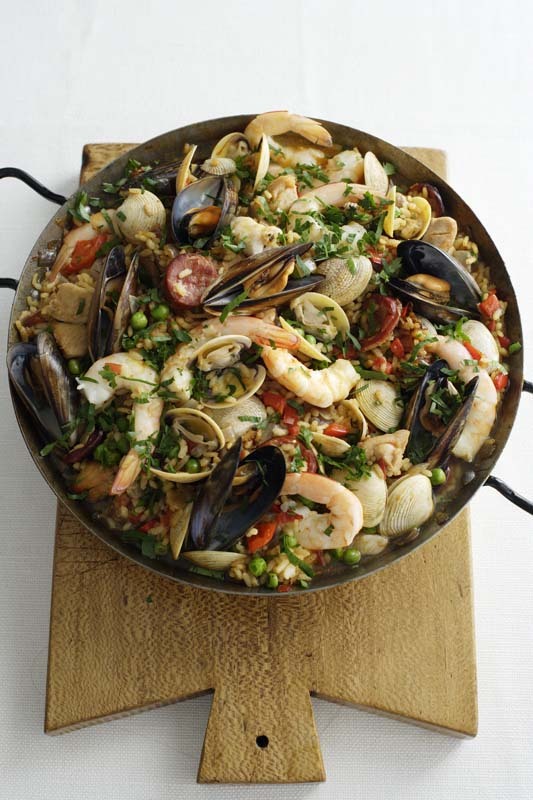 So I was interested to read How to cook paella, according to Spanish chef Frank Camorra. Frank is a wonderful chef and I only disagree about when to put in the rice and the stock. I like to put my rice in first, to coat it with the sofrito and to taste it slightly, whereas he puts the stock in first. I’d be interested to hear which method you prefer. Puglia is a relatively undiscovered part of Italy, it’s where Italians go for holidays! Why not join me and find out for yourself? “I loved every moment of the tour, Lyndey is an excellent host, great fun & very knowledgeable in wine & food while our tour guide, Max, knows the history of Puglia so well, which was great as we visited lovely old towns with amazing old buildings.Our accommodation was 4 to 5 star & wonderful & we had some truly amazing meals & wines. 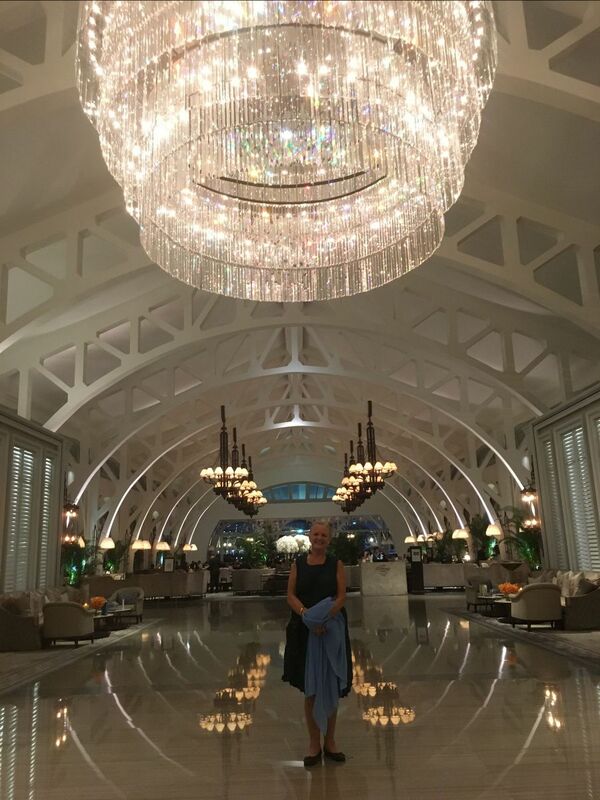 The travel plans were up to expectations & Ali Pike from Southern Visions Travel very efficient, we were in a very comfortable bus for touring each day.” writes Julie Tulloch, a fellow traveller in May last year. It was such a fabulous experience, we are repeating it in October 2019 to share the joy with others. You might like to come on an unforgettable week of culinary and cultural exploration. 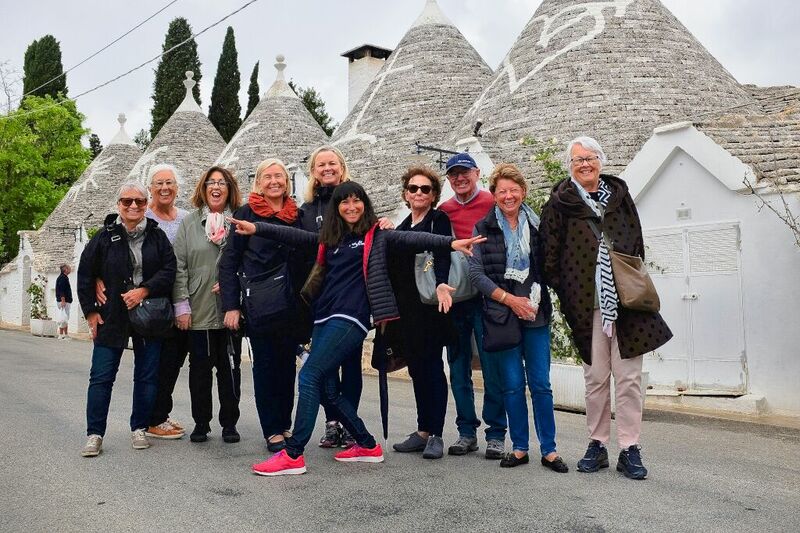 Think hands-on bread, cheese making and cooking class; visits to wineries, olive farm, tours of UNESCO sites Alberobello & Matera & other cultural centres with local guides. All sensational meals and wines included. You only need money for the very inexpensive shopping you will find there. Follow my food and travels on Facebook, Instagram, Twitter and Pinterest. 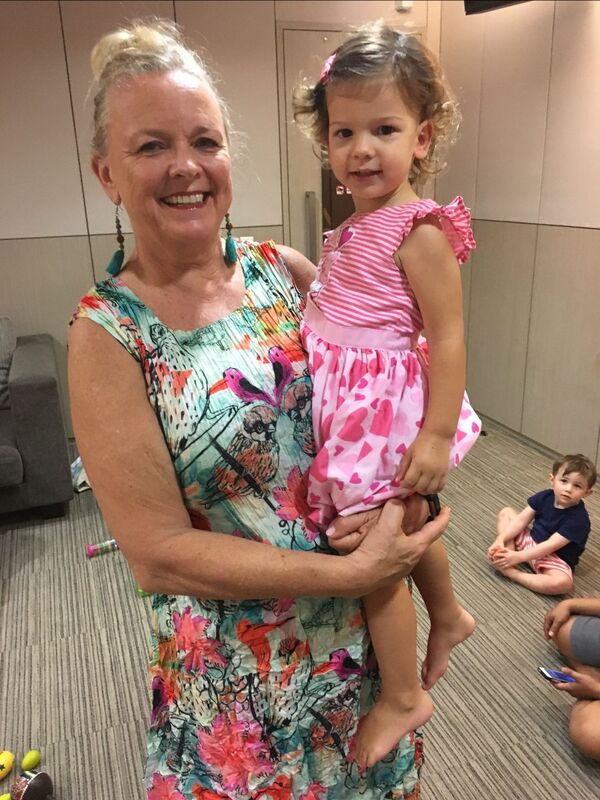 Please share my update with your family and friends. They can subscribe here. And I am now storing them on a tab on my website, so you can look back at previous updates.What are you cooking, eating and drinking?